How Far is Ramky Pearl? 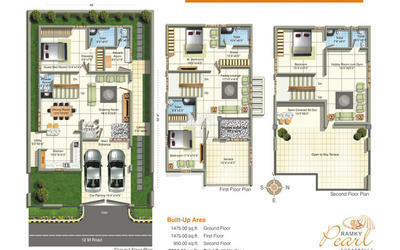 A 17-acre habitat with luxury triplex villas in Hyderabad. Given the sprawling acreage sitting by a natural lake and expensive real-estate at Hyderabad - an emerging global city where space comes at a hefty premium, its only fair to assume that this project is located somewhere on the city outskirts. Think so Allow us to differ. Ramky Pearl is located bang in the bull's-eye of the city's booming growth at Kukatpally - a location that's well within the central business & residential districts of Hyderabad. Perhaps, it's the epicenter, if the frenzied rush of developments at Kukatpally and its surroundings. Internal - Double coat cement plastering. External - Double coat cement plastering. Best teak wood frame & shutter aesthetically designed, with melarmine polish, fixed with door eye-view and hardware of reputed make. Best teak wood frame and flush shutter with veneer, finished with melamine matt polish and fixed with hardware of reputed make. Best teak wood fame & glazed shutter aesthetically designed with melamine polish, fixed with safety grill and hardware of reputed make. Best teak wood frame & glazed shutter aesthetically designed with melamine polish, fixed with safety grill and hardware of reputed make. Premium quality texture finish with two coats of weather - proof paint for front elevation. Smooth luppam finish with two coats of weather-proof paint over a base coat of primer on other sides. Designer glazed ceramic tiles dato up to ceiling. Telephone provision for master bedroom, drawing and living. Intercom facility connected to the security.